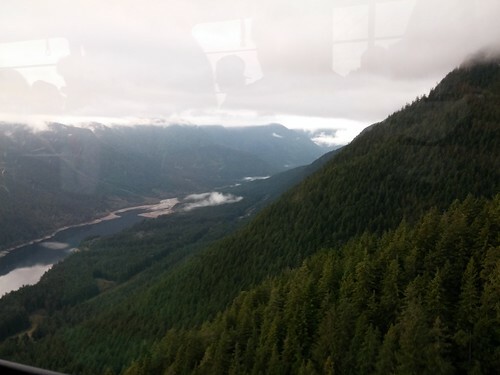 Whether you live nearby or are visiting the Vancouver, BC area, a must-see is Grouse Mountain just fifteen minutes north of downtown Vancouver. A ski slope during the winter season, Grouse Mountain has plenty of amenities and activities to keep visitors, young and old, entertained year-round. My husband and I visited the mountain this fall with our two daughters, ages 1 and 3 and had a blast. There are two ways to get to the top of Grouse Mountain from the parking lot at the base: you can hike the 2.9 km trail to the top (referred to as “the Grouse Grind”) or ride the Sky Ride gondola up from the parking lot with purchase of an admission ticket. I have friends who have hoofed it up to the top on foot with children in tow, and I applaud them. 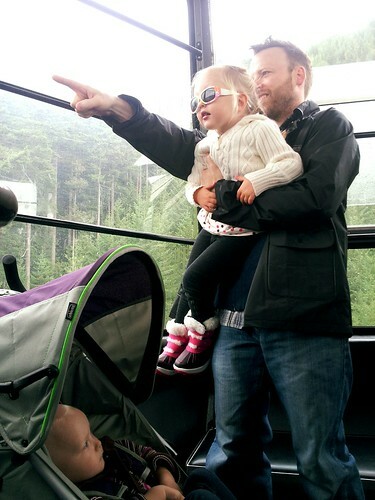 We are not the hike-with-kids-strapped-to-our-backs kind of parents, so we opted for the gondola ride up. The Sky Ride cars come every 15 minutes and the glide up the side of the mountain is a pretty smooth six-minute ride with incredible views (on clear days). The gondolas are larger than I expected. They fit 50 or so people and have plenty of room on board for wheelchairs and large strollers. Once up to the top of the mountain, you can get your bearings (and use the potty) inside the Chalet, immediately next door to the Sky Ride station. The building doesn’t have an elevator inside so if you need to get from the first floor to the second (where the potties are) with a stroller or wheelchair, plan on rolling up the hill outside the front door to enter the side door above. While I recommend packing some trail mix and juice boxes for the little mountain adventurers, there are food options up there if you need to refuel. In addition to a few snack stands around the mountain, Altitudes restaurant on the second floor of the Chalet is a legit restaurant with panoramic views (on clear days) and a sufficiently wide menu. We’re gluten free/veg and were happy with the tomato salad, the hummus platter (without the pita wedges) and the very large glass of fresh carrot/apple/ginger juice from the adult menu. 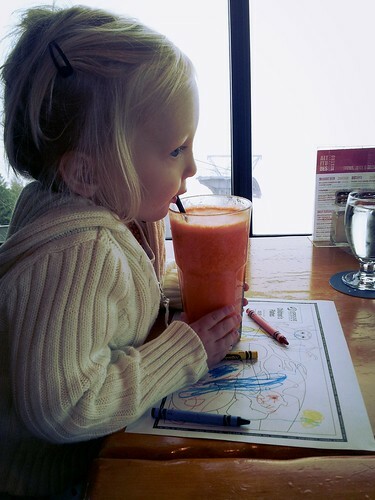 The restaurant does have a kids menu (with CRAYOLA crayons! ), though 100% of the menu options contain meat. Besides the restaurant, the Chalet contains two art galleries, a movie theater, apparel shop and rustic lobby. While the Chalet is fairly stroller-friendly (aside from the whole doesn’t-have-an-elevator thing), the movie theatre has stadium style seating which is not stroller-friendly, so heads up if you plan to watch one of the documentaries while you are up there. We visited Grouse Mountain during the Artists for Conservation festival (which I highly recommend if you can catch it next year), so the galleries were filled with gorgeous pieces of nature-themed art and there were all sorts of cool presentations and displays throughout the Chalet. 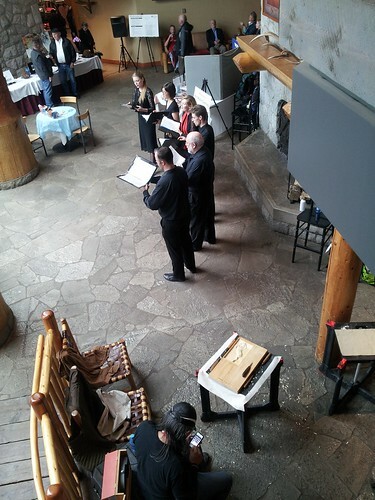 During our visit, we enjoyed excellent live music and a First Nations carving demonstration. 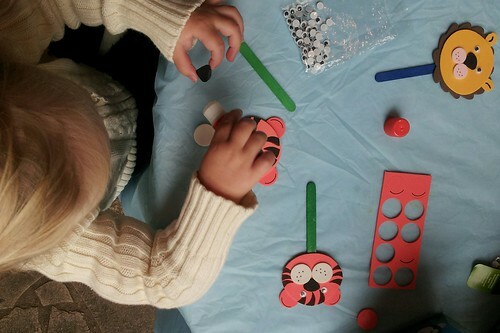 The girls made a few animal-themed crafts and we got up close and personal with a live bird of prey in the lobby. 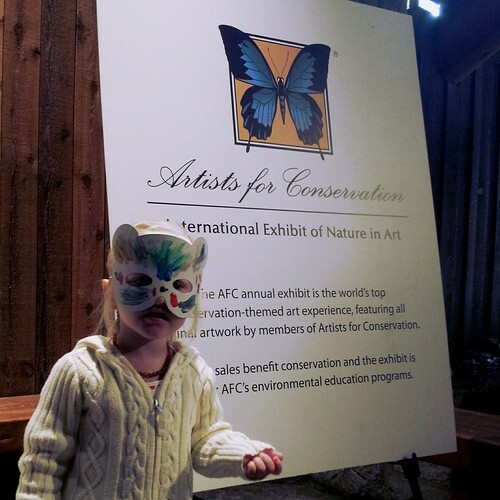 The Artists for Conservation festival was really cool and added to our mountain adventure. 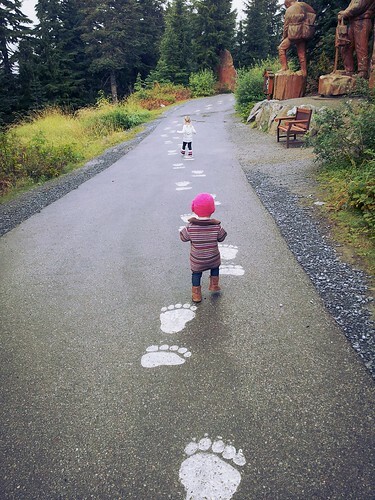 Outside the Chalet, we let the girls loose to sloooowly follow the white bear prints (and jump in every puddle) along the paved pathway to the grizzly bear preserve on the Plateau. We happened to arrive just as the bears, Coola and Grinder, awoke from their afternoon naps. 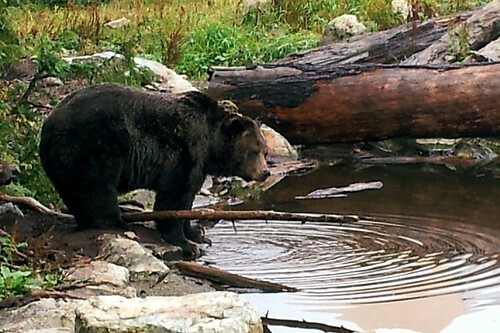 We stood on the bridge over their habitat which gave us a fantastic view of both bears as they snacked on apples and played in the water. Because the bears were active and a crowd of us gawkers had formed, a ranger came over and shared interesting info as we watched. After the bears got bored with us and wandered back into the woods, we made a loop around the plateau over to the world famous Lumberjack show. It’s an outdoor show with plenty of bench seating. Before the show started, the sound system pumped catchy lumberjack-themed bluegrass music (who knew?) 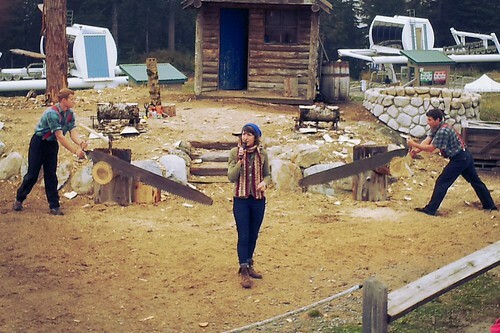 to get us into the woodsman spirit. The show was toddler-friendly until the chainsaws came out near the end. It was a little loud for our girls, so we took that as our cue to head back toward the Sky Ride station for the gondola ride back down to our car. 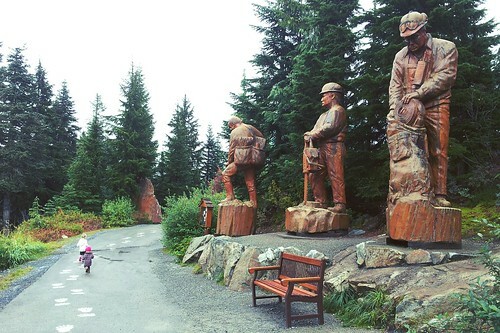 Grouse Mountain is a great day trip out of the city because it offers a wide variety of indoor and outdoor activities to entertain all ages, even toddlers. There are, of course, activities not suited for most little kids like helicopter rides and zip-line courses, hiking trails, guided eco-tours and the skiing activities in winter. But just riding the gondolas, taking in all the activities inside the Chalet, eating a light lunch, meandering along the paved trails, climbing in and around the huge carvings, and watching the bears were all plenty to keep our girls busy for several hours. It’s pretty magical having an easily accessible mountain (with BEARS!!) so close to downtown. It really is a great escape from urban living and worth the cost of admission. Allison Baltzersen is a green mama, raising her two little girls to enjoy childhood, ask lots of questions, and be kind to the Earth. I’ve lived in Victoria my entire life but as yet, haven’t visited Grouse Mountain. These photos are just gorgeous! Thanks for sharing them! Looks like an amazing spot to spend a day with family. I have been to BC. Hoping to get back again some time. Grouse Mountain will now be on my ‘things to see’ list if I ever make it out west again. Great review, enjoyed reading this immensely. We love Grouse Mountain! It’s just far enough, but not too far. Love being out in Nature. We really need to take the kids up there this Winter! We love Grouse Mountain! And these are great photos! Looks like a fun and cool place! What an amazing place,you must have love it ! I enjoyed Allison/s post and her pictures. I had never heard of Grouse Mountain. I think this would be a wonderful outing for anyone . They have lots of amenities and even bears. This would be such fun for any child and their parents. Thank you for such an interesting post. Beautiful photos,Thanks for sharing them! looks like the pace to visit. thanks for sharing all of your tips ! So many places we did not get to when we lived in BC. Grouse Mountain is on the list to do when we get back there. These photos are just beautiful! Thanks for sharing them! This looks like a wonderful place to visit with the family anytime of year. Looks like fun! Will go next time we are down. A beautiful place to visit with family !